When did you discover anime? Share as much as you remember. I remember watching Transformers Gen-1 and Voltron, and knowing they were slightly different from typical cartoons. I knew they were from Japan, but I didn’t really recognize anime is its own thing until a few years later. When Sailor Moon and Dragon Ball Z were in syndication in the early-to-mid 90s, I didn’t care for them. When I first saw Teknoman on UPN Kids (an adaptation of Tekkaman Blade) I was hooked. How old was I? Around 6 or 7 when I first saw Transformers Gen-1, if that counts. I watched Dragon Ball Z and Sailor Moon when I was 9. And Teknoman is what sparked my love of anime when I was 10 and a half. It aired in summer of 1995 on UPN, the network that eventually became the CW. YouTube the Saban theme song and the transformation sequence. Just trust me. What appealed to you about anime when you first discovered it? It seemed like they were telling stories where each episode went into the next one. What would you say was the most popular anime at the time? At this time, anime was still very obscure in America. It’s really hard to say. Maybe Sailor Moon. Dragon Ball Z had just started in syndication and was only beginning to pick up. What was it like to be a part of anime fandom at the time? It was a clear line. Sailor Moon was for girls, and everything else was for boys. Man, how things have changed! How did you connect with other fans at the time? I was fortunate in that I’m of the generation that Toonami targeted—I was a teenage boy when they were making shows for teenage boys. It was the foundation of my high school friendships. I was the Gundam Wing kid. Back in the day, my first few times making female friends was over how I didn’t hate Sailor Moon as much as other boys did. Where did you buy it? Oh, man. Maybe at Hot Topic. This would’ve been 2000 or 2001, so it’s really tough to say. Toonami was SO BIG at the time that it could’ve been sold anywhere. Hot Topic is most likely. Why was Gundam Wing such an important show to you? I think it really goes back to what even little David liked about anime. Space. Drama. A story. Characters that had some gravitas to them. It felt so different from Dragon Ball Z, and it just pulled me in. Like a lot of people, Gundam Wing was my gateway into the Gundam franchise. I eventually got a second GW T-shirt; a white Tallgeese shirt that did fit better. It featured the character that I call “my first waifu,” Lucrezia Noin. It also included Zechs, and the Tallgeese and Epyon [mobile suits from the show]. It was the rest of the Gundam pilots. It was Treize. It was EVERY DAMN CHARACTER… except for Dorothy. To hell with Dorothy. Being a fan of Gundam Wing was fine, honestly. Everybody still watched it, and people liked it. And it was also the fact that at midnights, Cartoon Network would show Gundam Wing “uncut” and seeing anime on TV that had fewer edits made everyone that much more excited. What did your family think about your fandom? They really had no issue with it at all. They knew that wrestling and the Japanese cartoons were what was in at the time. My sister fully supports and endorses my podcasting, and my dad always asks me, “When’s the next convention?” It’s definitely been one of those “as long as you’re happy” kinds of things. Do you remember your first anime convention? My first anime convention was Youmacon 2008 here in Detroit. After I got out of the Air Force, one of the things I asked myself was “Why have I never gone to an anime convention?” When I found one in the area, I knew it was time. I took the bus to the convention center in Dearborn, MI. It was everything I hoped it would be. I ended up making a friend over her cosplay of the Major from Ghost in the Shell. Some of the highlights for me were panels on Gundam and cool cosplayers. I’ve been to over 40 conventions since and still going strong. What was it like being an anime fan in the Air Force? Being an anime fan in the Air Force was a breeze. There were a ton of us. It was an extension of my teens, where no matter where you came from, no matter your background, Toonami and anime was what it was all about. By the early ’00s and into the mids, being in your late teens and early ’20s and liking anime had almost become normal. And yes, even back then, the crossover between anime fans and wrestling fans was still strong. What’s the biggest contrast between anime fandom when you got into it and now? Accessibility. The internet has come along way from when I was accidentally stumbling onto raunchy Gundam Wing fan art in high school. Streaming, YouTube reviewers, guys from Detroit that host two anime podcasts at the same time [a reference to David and his partner’s two podcasts]. The internet also helped me find out that I was not crazy in thinking that girls liked anime just as much as guys did even when I was younger. The fandom in the western world is a big fandom, and we’re all better off for it. Speaking of raunchy Gundam Wing fan art (I’m sorry, possibly), what was the fandom internet like? Were there particular sites you visited? At the time, I visited ToonZone and the Toonzone Forums. Along with that, cnxtoonami—eventually known as The X Bridge—run by Jeff Harris, best known as “nemalki” back in those days. And don’t worry about the GW fan art. If you couldn’t figure out Quatre and Trowa at least, you had your head in the sand. You said the internet showed you how much girls liked anime, too. Why weren’t you sure before? Aside from Sailor Moon, girls that I knew didn’t talk about anime much with other friends that I had. I guess they weren’t as comfortable with them as they were with me. It definitely wasn’t a boys club mentality. It was more the other way around, in that the girls isolated themselves, until I worked my charms. Forget that last part. I’m sorry. David can be reached on Twitter. When did you discover anime? Share as much as you remember. My earliest was “Battle of the Planets” (Science Ninja Team Gatchaman) as a elementary school kid, but I only vaguely knew it was anime at the time. When I got serious was with AnimEigo VHS rentals in 1991. Bubblegum Crisis and Urusei Yatsura had me hooked from then on. After that, I joined an anime club about an hour away, and started going to cons soon after. What appealed to you about anime when you first discovered it? Mature and complex themes, ease of telling fantasy and science fiction stories that would otherwise never be made due to the cost of other media. What would you say was the most popular anime at the time? Hard to say back then; there was very little widespread communication. The internet was not filled with easy-to-use social media at the time. But probably Bubblegum Crisis. Everyone had seen it, the music was incredible, and it was easily identifiable to western fans that loved sci-fi and Blade Runner. What was it like to be a part of anime fandom at the time? The meetings for Anime Club of Michigan were in a tiny ostracized corner of a monthly comic book convention at a VFW [Veterans of Foreign Wars] hall. There were about 12 chairs, a TV, and a VCR. People were free to come and go so it was a major source of new fans, but we always had a few parents sit toddlers down to “watch the cartoons”. The shows that really floored me at the time were Record of Lodoss War and Legend of Galactic Heroes. We had strict rules about fansubs. Anyone that charged for a fansubbed VCR tape was basically scum. Our club traded recorded fansubs for blank VCR tapes (of a required quality). You could do 2-4 per month depending on demand, and pick them up the next month. The only time money changed hands was for shipping if someone couldn’t pick them up, and it was exact as possible. Once a particular show was licensed, we always stopped distribution. Back there there was basically no translated manga other than a few 12-20 page VIZ titles that were flipped and broken up to fit normal american comic format. I also regularly hit the local Japanese bookstore. Absolutely no English titles there, and I couldn’t read them, but faithfully bought “Nakayoshi” [a shojo manga magazine] for this new CLAMP manga called Magic Knights Rayearth. When it became an anime, I repeatedly drove to this store an hour away, rented an unsubbed recorded-off-TV VCR tape, drove home, then drove back and returned it (uphill both ways, git off mah lawn). Watched the entire first season that way. Still love that show. What kind of video store let you rent something like that? The store was a Japanese bookstore, absolutely no English materials there at all. They had cheap rentals of VCR tapes recorded directly off Japanese TV, commercials and all. This was long before YouTube even existed. It was a way for Japanese people living in the US to still see shows they loved or keep up with things. When did you attend your first convention? Went to my first real convention, Katsucon #2, in 1996 because Katsura Masakazu (Video Girl Ai) was there. 800 attendance, it was a 500 mile drive for me, alone. I took up cosplaying after that and got more of a convention crew to go with me of friends and SO’s. I think I have always attended at least one con every year since then. I still remember saying “Sailor Moon would never be shown on American TV.” Thankfully I was proven wrong a few years later. Fandom really picked up then. Fandom began as something solitary for you, but now your wife is an anime fan, too. How did you two meet? At the very start I had a friend that I watched rented VCR tapes with, but he wasn’t serious enough to regularly travel and make club meetings, but enjoyed watching stuff when I could manage to get my hands on a show. My wife had a common story for many: she grew up watching Sailor Moon on US TV. She had a close friend that was highly involved in a local club and a local convention. We met through a mutual friend on IRC chat that was mainly anime and Legend of Zelda-oriented. I got involved with that group by way of a conversation about Saint Seiya. Did you meet your wife in-person for the first time at a fandom event? Yes, but we were not long distance dating yet at that time, we were meeting mutual friends. It was at JAFAX, a smaller Michigan convention. She was very blue, cosplaying an OC character from her novel—with a leotard and elaborate face paint. She’s a very outgoing cosplayer and does not mind being seen by, as people put it then, “normies.” We ended up going to a restaurant with convention staff, most of us in cosplay, and that’s how we met. What’s the biggest contrast between fandom when you first discovered it and fandom now? I really think the Internet has changed convention cosplay. I’ve attended many conventions several times yearly from 1996 till now. 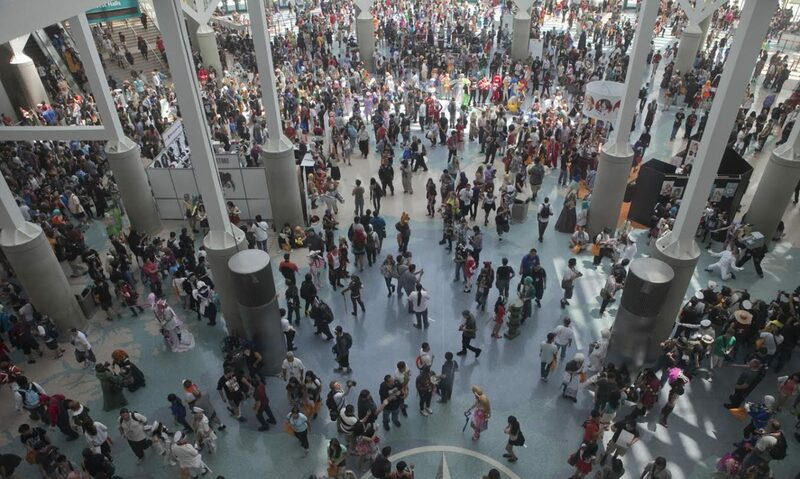 With more and more social media and availability of convention photos, the average fan who has never gone to a convention before sees professional cosplay from all around the world. They see amazing outfits with retouched photos. When they actually get to a convention, they see normal people doing what cosplay they can with the budget and ability they have. It’s changed the feeling of cosplay over time. There are more attendees that view cosplay as something that exists for their own entertainment, instead of the cosplayer’s. Expectations have changed, shaming became more prevalent, and there is less focus on just cosplaying a character you love, any way you could, for yourself. Things got kinda bad around the late 2000’s with harassment, hallway catcalling, guys blocking hallways insisting on hugs, cosplay shaming websites, and the like. The “Cosplay is not consent” movement has made things better in the past few years in my view. Everyone benefits when people wear whatever they want feeling comfortable and safe doing so without harassment. On the other hand, the internet has really improved anime watching. Back in the early ’90s there was no YouTube. There was no streaming video of any kind. Any anime on TV was very, very rare and if it was shown, it was a shadow of its former self with plot changes, and even splicing shows into one another. Other than that you watched what you could get from fansubbers. Many times you didn’t even know a show existed at all unless you ventured into a Japanese bookstore and bought untranslated manga. Releases from AnimEigo and other companies were very rare in the early ’90s. If you wanted to see a show like Sailor Moon or Marmalade Boy, you were out of luck unless you had access to fansubs at the time. Any show targeted for women just was not licensed here at all before 1995. Fansubbing now has a bit of a bad rap because we have alternatives, and a completely unlicensed show is very rare outside of licensing legal trouble. (Such as all Macross shows that still has no ability to be licensed outside of Japan currently.) But back then fandom, didn’t exist without it. There was a clear code with most anime clubs: Don’t distribute licensed works. Don’t sell fansubs for any profit. (Shipping and cost of VCR tape if absolutely necessary, but usually a blank tape was traded.) We tried to keep money out of the equation. Many isolated fans had no choice but to buy some fansubs from shady dealers, but they didn’t know there were alternatives. Today, it’s hard to imagine fandom without video on computers. If you want to see a trailer or opening for a show you can, any time you want. It’s very easy to check out shows you might like. Mark D. can be reached on Twitter. When did you discover anime? Share as much as you remember. I was in 6th grade, so I was 11 years old. My best friend at the time asked if I wanted to come over and watch Sailor Moon, a show I had never heard of. She told me it was called anime. Later, we visited her older sister’s room, which was papered from floor to ceiling with printed-out anime pictures. We borrowed some of her older sister’s VHS tapes of The Slayers to watch in the basement. I was hooked. What appealed to you about anime when you first discovered it? None of the American shows on TV resonated with me. My sisters and friends liked shows about attractive teenagers in high school, but I didn’t see myself in those characters at all. I liked bombastic and flawed Lina Inverse better. What would you say was the most popular anime at the time? Either Sailor Moon or Dragon Ball Z, which were both airing on Toonami. How could people watch anime? How did you? You could watch a very limited selection on Toonami, or you could buy anime on VHS at Sam Goody, Suncoast, or Another Universe at the mall. (None of these stores exist now). The first anime I bought was Neon Genesis Evangelion at Another Universe. It cost $30 for three subtitled episodes. Since it was so expensive, most people picked just one show to collect. My Evangelion tapes are extremely beat up because I swapped them with friends to watch what they had. Were you part of an anime club? No, but I spent a lot of time in middle school with a group of girls who were also really into anime. We would watch it at sleepovers. We also gave each other nicknames; mine was Ren-chan. Today I’d rather not share something so embarrassing! Are you still friends with anyone from that time? Yes, most notably my friend Kailer. We still hang out and recommend anime and manga to each other (usually BL stuff). What was it like to be a part of anime fandom at the time? Fans found each other online. There was Anime Turnpike, a list of links to what was probably every anime-related website at the time. You could write fanfiction on fanfiction.net, but there was no real hub for fan art or other fanworks, so people would create sites called “shrines,” dedicated to either individual characters or “pairings,” two characters they’d like to see date. For example, I was a fan or Nuriko from Fushigi Yugi so I would spend time on Nuriko “shrines” seeing people’s fun facts and fanfic about them. When did you first attend an anime convention? Not until I was 20, in college. My first convention was Otakon 2006. What were anime conventions like then? This was only 10 years ago, so not so different than they are today. Otakon already had a five-figure attendance number, which was a huge shock to somebody stopping by for the first time. I had never seen that many anime fans in one place before. What’s the biggest contrast between anime then and anime today? Access. It is much cheaper and easier to get anime now than it ever was then. Interested in sharing your own introduction to anime?